We all use Android applications on our Smartphones. Sometimes they give the best results when used on PC. For this, we need to download, install and Run Apk Files On Windows 10. But these Android Apk files cannot function in windows directly. We should take the help of some emulators or use other methods to make them function on Windows 10 Operating System. So, here we will learn the methods of How To Run Android Apk Files 2019 in Windows 10. This can be done using and without installing an emulator on your computer. The windows 10 operating system is more powerful which we all like to use in systems. There are few Apk’s which work well and give full features in PC than in Android mobiles. The Android Apk’s are designed in a way where we can install them in mobiles, tablets and also windows very easily. But whereas in windows we cannot install them directly as the hardware and software does not match. So, the emulators act as a bridge between them and make it easier to download and install these Apk files. Let us see the best methods to Run Apk Files On Windows 10. These Apk files are a package that contains app and installer. Unlike the Apps available directly in the Play store. We can directly download them from the browser and install them on windows 10. To run Android Apk files on Windows 10 directly you can use these two methods. To make Windows 10 run the Apk files we can use the extensions or use SDK. We will see these two methods below which are quite easy. If you want to directly install these Apk files than it is the simple and best way. Using the Android Software Development Kit (SDK) it is very easy and needs some technical knowledge. To use this technique make sure you have java program installed on your Windows 10. Follow the below guide to run Android Apk files in Windows10. Go to your browser and search for Android Studio official page. Scroll down the page and download command line tool. Now download the files dedicated for windows and extract in C drive. Open your Control Panel and search for Advanced System Settings in System option. Choose the environmental variable and highlight path and tap on edit and give C:\Android\sdk\tools;C:\Android\sdk\platform-tools. Now open your Apk files by double-clicking on them and they will open directly using the SDK software installed on windows. If the above method looks tedious or has problems using then you can try this simple extension. 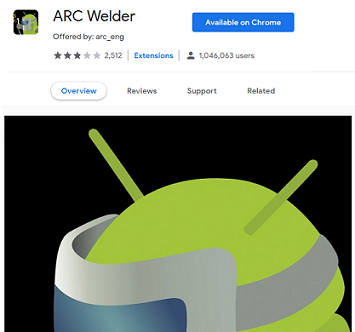 The ARC Welder will definitely make easy to Run Android Apk Files In Windows 10. This is a chrome extension that allows Windows 10 to run Apk files within the browser. It is easy to use but does not work flawlessly than the previous one. Search for ARC Welder extension in chrome and add an extension to the browser. Download the Apk files and open them with the extension. You can also select the portrait or landscape mode to use these applications on your windows. 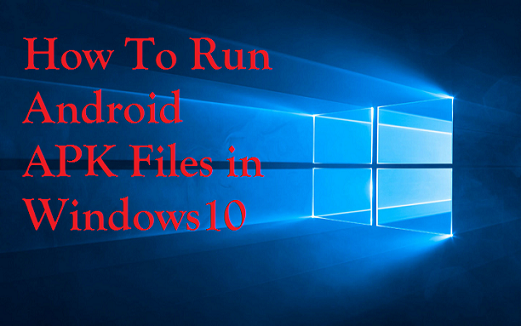 This is the simple and best method to run Android Apk files in Windows. There are many emulators available on the internet to install on windows 10. These are officially installed and do not cause any damage to your computer. With these emulators on PC, we can easily download and install the Apk files. We can directly search for the Apk files in emulators. You can also download them from the browser and install using the emulators. Here are many Best Android Emulators For windows 10. So, the emulators are the best way to make the Apk files run on windows. There will be no lag while opening the App and along with all features of the application. Here we will discuss the two popular emulators Bluestacks and NOX to install the Apk files on windows. This is very easy to install this emulator on windows. This gives the best solution to run the Apk files on windows. 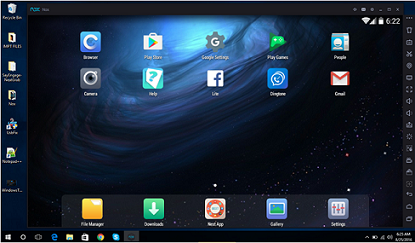 We can also use many apk files within the BlueStacks in a simple way. So, below we have mentioned the method to install and run Apk files on windows 10. 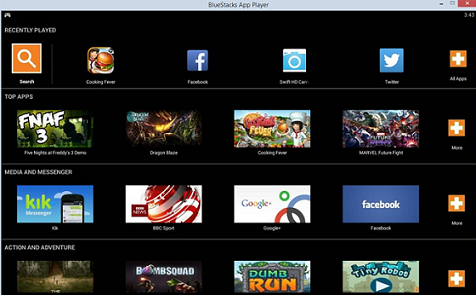 Open your browser and type BlueStacks emulator and click on the official website page. Tap on the download and in few seconds the emulator will install on your windows. Open BlueStacks and in the search box type the Apk file you want to download and install. Click on the desired Apk file it will install in few seconds and use it in the same way of Android devices. If you have any Apk files downloaded on your computer open them using the BlueStacks Emulator and install them. Download the NOX Player from the official website available in the market. Set up it with the preference and default settings of your choice. Load the Apk files you want to use with the Player. We can also download them from the browser and open them using NOX Player. Both the methods using the emulator will be the great choice to run Android Apk files in Windows 10. We have given the details about How To Run Android APK Files 2019 in Windows 10. Here we have discussed using an emulator and without emulator methods. Hope this article will help you to run the Apk files on windows without any problems. For more regular updates check Timesalert.